Metropolitan Trucking Now Hiring Drivers in the Cary, NC Area! Competitive Pay Packages! Our drivers average pay to .62 cents a mile! Minimum pay program $1,100.00 a week & $1,200.00 a week for drivers with the HAZMAT endorsement! Now Hiring Drivers in the Jeromesville, OH Area! Metropolitan Trucking Now Hiring Drivers in the Elizabeth, NJ Area! Competitive Pay Packages! Our drivers average pay to .62 cents a mile! Minimum pay program $1,100.00 a week & $1,200.00 a week for drivers with the HAZMAT endorsement! Now Hiring Drivers in the Lewistown, IL Area! Metropolitan Trucking Offering Competitive Pay Packages! Now Hiring Drivers in the Hingham, MA Area! Our drivers average pay to .62 cents a mile! Minimum pay program $1,100.00 a week & $1,200.00 a week for drivers with the HAZMAT endorsement! Now Hiring Drivers in the Morrow, OH Area! Minimum pay program $1,100.00 a week & $1,200.00 a week for drivers with the HAZMAT endorsement! Now Hiring Drivers in the Spiceland, IN Area! Minimum pay program $1,100.00 a week & $1,200.00 a week for drivers with the HAZMAT endorsement! Now Hiring Drivers in the Homer, OH Area! Metropolitan Trucking Offering Competitive Pay Packages! Now Hiring Drivers in the Bolton, CT Area! Our drivers average pay to .62 cents a mile! Metropolitan Trucking Offering Competitive Pay Packages! Now Hiring Drivers in the Mendenhall, PA Area! Our drivers average pay to .62 cents a mile! Welcome Drivers! It won't take long for you to experience our "We Care" attitude. Family is important to us and that is why we are always looking for opportunities to match our driver’s needs as professionals with a lifestyle benefiting both them and their families. At Metropolitan, we are committed to providing more pay per mile, and more miles per week while still offering the home time our drivers want and deserve. We also offer the most comprehensive benefit package in the industry today. 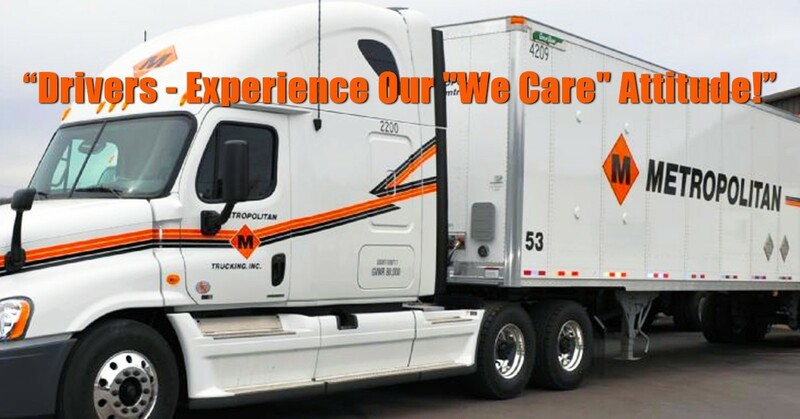 Everyone at Metropolitan understands and appreciates that a driver has the hardest job in our company. Treating our drivers with the respect they deserve is our top priority. We welcome you to join our family and become a part of the most dynamic team the trucking industry has to offer. Metropolitan has a $1100.00 a week for non hazmat drivers and $1200.00 minimum pay per week program for our drivers. Call or Apply Today for More Information!